Note: the mod version of Forgotten Empires is no longer patched. For continued support, please check out our Steam page. 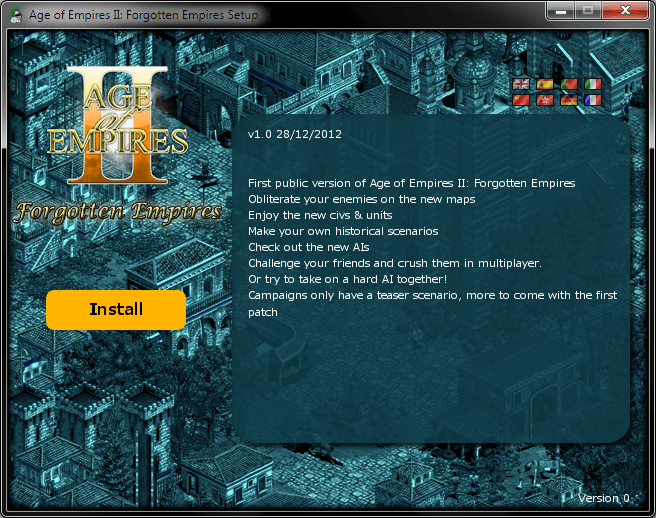 Age of Empires II: Forgotten Empires is an unofficial expansion for Age of Empires II: The Conquerors. You thus need the original Age of Empires II “Age of Kings” and the official expansion pack “The Conquerors” before you can install Forgotten Empires. Got problems? Check our Support page here! If you have problems picking your language, check this page!